Is there a rule somewhere that the bigger the man, the softer he is? Or maybe it’s because of his crush? Yea. That’s the answer. After one year (really?!! A year really flashed by…), the big teddy bear joins Running Man again. They love him enough to do a 3-episode special, and this is the second part. Exo boys also have a cameo part in the nametag game. Exo’s fans, forgive me, as I no longer follow Kpop so their names escape me (Boy 1, Boy 2, it is. Seriously, 11 boys?!! Oh SM…) The nation’s first love also comes to visit, playing and laughing along with the PD’s matchmaking skills. Suzy is mature and sophisticated for Harper’s Bazaar in France while Esquire magazine’s editor saturated Lee Seung Gi‘s photos with too much purple. And for god’s sake, the location is in Hawaii, you could at least show the beautiful scenery with blue oceans and sea life (read: shirtless goodies.) But all you have are face shots. REALLY? Why did I include them together? They’re hot off The Gu Family Book, as we all know. 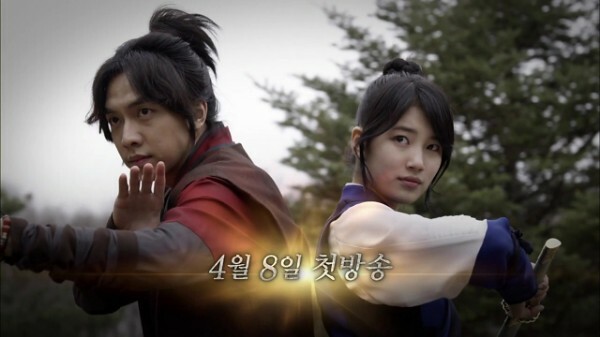 Also check out Mnet’s award video of Suzy meeting the fake Kang Chi onstage. Cute. Note: Please be warned. The synopsis above has been improvised by Kappy for her snerking. I’m experimenting with a new video hosting website. Also, Ji Hyun Woo (QIHM) is in this. Let’s see what we have this week: Suzy’s reply to Yeo Jin Gu’s love call; the cast of Equator Man discusses about the ending; Daniel Choi is attracted to Lim Chang Jung in a bloody, melodramatic way; Kang Ji Hwan gifts flowers to his supporters on the street. Alluring week!